Universal Orlando resort has introduced a new kind of paranormal experience. A virtual reality and realistic environment are combined to create a new kind of theme park attraction. This Halloween Horror Nights 26 experience is available from September 26th to October 31st. The Repository is available on select event nights and a reservation is required. A reservation is $49.95 plus tax. Joining a team of investigators, enter a centuries old, secret warehouse where mysterious artifacts have been collected and stored for hundreds of years. Advanced supernatural and paranormal devices are being tested using state-of the-art technologies to determine the power these relics hold. You make your way through multiple rooms and find yourselves transported to various worlds in this personalized, mind-bending experience. 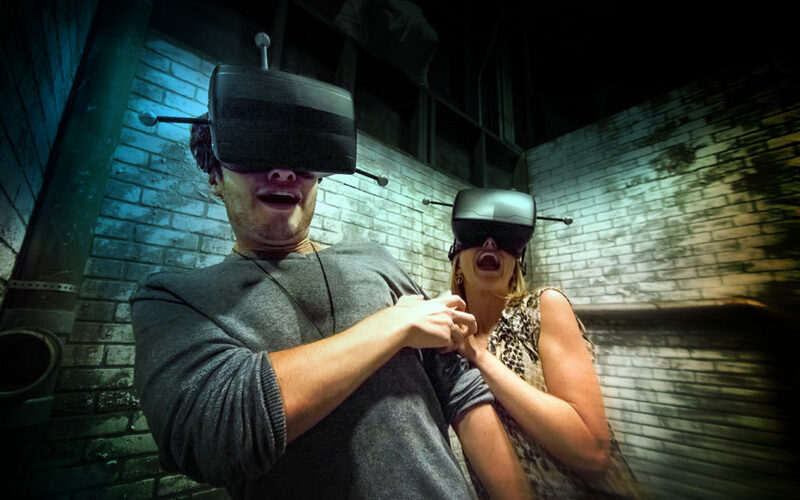 This experience combines virtual reality and an immersive theater environment. While walking and wearing a headset, guests will experience an environment consisting of enclosed spaces, locations of great height and scary/intense interactions. This experience is permitted for ages 13 or older. Guests may remain in standard wheelchair throughout. Guests using motorized wheelchair or electric convenience vehicles should see an attendant for assistance. Guests with service animals should see an attendant for assistance. Photography or video recording, eating, drinking, carrying children, or smoking is prohibited. Note for guests who wear eye glasses you may or may not be able to fit glasses within the headset equipment. The Repository combines live actors and virtual reality to create a one-of-a-kind psycological experience.